“I am Abla Saadat, wife of freedom fighter Ahmed Saadat, detained in the Zionist occupation prisons and sentenced to 30 years.” This is how Abla Sadaat, wife of one of the symbols of Palestinian resistance, introduces herself. The court case took two years and was steered by three judges. If found guilty, Saadat risked a prison sentence of over 10 years. “But Saadat was given a 30-year sentence, only because he is the secretary general of the PFLP… There were no direct accusations that would legally warrant a 30-year sentence. The ruling was political … He rejected the court, he refused to stand in court or say his name out loud … For the first time ever a ruling was made without any accusations of killing or testimonies against him,” says Abla. 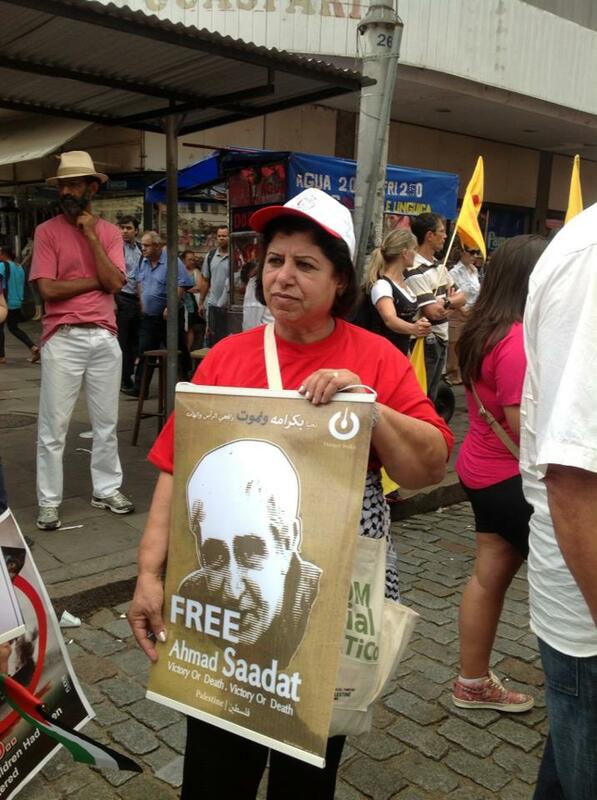 Two months after the ruling, Saadat was put in solitary confinement. According to Abla, he was moved based on the claim he had strong influence on detainees around him and on lawyers who visit him, and that he posed a danger to Israel’s security. He remained in solitary confinement for three years until in 2011. His fellow prisoners went on hunger strike demanding he and others be no longer kept in isolation. “At the time there were 22 … They were isolated from life, from other detainees, were not allowed family visits. No visits except through the Red Cross,” Abla recalls. The hunger strike for an end to solitary confinement, explains Abla, started in 2011 and lasted for 22 days. The Gilad Shalit prisoner swap deal, which involved exchanging 1,027 Palestinian prisoners for captured Israeli soldlier Shalit, followed and included provisions on ending solitary confinement and administrative detention (prolonged detention without charge). The hunger strike stopped but solitary confinement did not end. Neither did administrative detention. In 2012, another hunger strike started and included this time not only PFLP members but also Hamas and Fatah-affiliated prisoners. 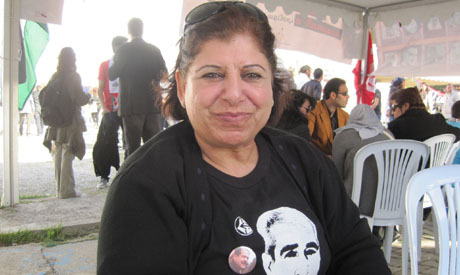 Around 1500 went on hunger strike, managing to get international attention, explains Abla. The visits, however, are heavily regulated. Only her and her eldest son are able to visit, says Abla. Now that Ahmed Saadat is in Hadarim Prison near Tel Aviv, and West Bank residents cannot reach it except with a permit, his children are no longer able to visit him. According to Abla, West Bank residents who have family members in Israeli prisons can only visit transported by a Red Cross bus. The Red Cross bus transports families of prisoners accompanied by a police car and is not allowed to stop at all except at checkpoints. Also any former prisoner cannot visit a prisoner; hence many of the families of the detained cannot visit at all. Some people have not seen their sons in over 10 years and in Abla Saadat’s case, her girls haven’t seen their father in seven years. “He missed so many stages in our life, like their graduation, wedding,” Abla says. There are no new movements, but there are factions within the Palestine Liberation Organization (PLO) that are neither with Fatah nor with Hamas, says Abla, giving the PFLP and the Democratic Front for the Liberation of Palestine (DFLP) as examples. Popular movements erupt in reaction to big events, explains Abla. “Since authority always wants to remain in control, neither camp wants unity or an end to the division, despite the prisoners’ continuous demands to end the division,” opines Abla. The last collective hunger strike of Palestinian prisoners was in April 2012. After that there were individual hunger strikes of prisoners in administrative detention, such as that held by Tarek Kadan, Samer El-Essawi, and others Abla Saadat says. “Usually strikes are made over collective issues, for example, inhumane treatment inside prisons, or banning prisoners from education, or administrative detention or solitary confinement,” Abla explains. In Abla’s view, to solve the issue of Palestinian prisoners in Israeli prisons, action should be collective. “We should always continue trying to put international pressure for the sake of prisoners, and pressuring rights organisation. Where is the Arab League, for example? Where is the Union of Arab Lawyers? This is their role, to pressure US and israel who don’t pay any attention to international conventions. Its not enough to keep expressing solidarity with Palestine and the prisoners. We want actual movements on the ground that could pressure Israel. They are prisoners of war and of freedom, and if you [Arab officials] keep negotiating, prisoners should be on the top of the agenda. Resolution 240 of the UN says resistance is legitimate because it is against occupation and that is internationally legitimate. So why would they arrest the secretary general of the PFLP, the second largest faction of the PLO? These are the things that we stress now — the importance of pressure, propagating against Israel, and highlighting the status of prisoners,” says Abla. When asked about the John Kerry’s initiative for a peace deal between Israel and Palestine, also involving Egypt, Abla Saadat believes it has accomplished nothing and that nothing can come of it. Frustrated that negotiations have done nothing but worsen the situation of Palestinians, Abla Saadat further complains that the building of the Separation Wall dividing Palestinian lands is almost complete, taking large parts of Palestinian land and dividing many Palestinian families. Abla Saadat fears that Israeli settlers will outnumber Palestinians in a few years, and will be able to force them to flee, “like in 1948, by killing, slaughtering, threatening their lives, their cattle and their land.” “[Israeli settlers will] force them (Palestinians) to migrate to Jordan and take all of Palestine while Jordan becomes the alternative homeland. Thats the plan of all Palestinian authorities,” believes Saadat. According to Abla Saadat, Obama’s recent visit to the Palestinian territories, Israel and Jordan is part of a plan to reach a deal that will only worsen the situation of Palestinians even more. “The US and Hamas are now talking of an agreement with Israel. Hamas has not declared it yet, but everyone is sure that it is involved now in negotiations,” says Saadat.